I’ve got a friend who renovates homes for a living. He’ll buy a place, fix it up and sell it. Having that mindset makes him think twice about cutting corners. It makes him more likely to spend a little more money to properly fix a problem, even if everyone else in the industry would just ignore it. By treating each house as if it’s his own (a place where he and his wife and four kids would want to live), it raises the quality of his work tremendously. Does it mean he spends more time on each house? Probably. Does it mean he sometimes sacrifices profit in order to do the right thing? Absolutely. But the houses, his customers, and his business are better off because of it. We need to take that same approach when working with clients in our studio. Whether you’re recording a simple guitar/vocal demo, producing a full album, or mixing and mastering for a client, the more you can take ownership of the project itself, the better the project will be. Treat the song as if it was your own, as if your entire reputation as a musician was based on how well that song turned out. It’ll change the way you work, and you’ll be better because of it. You’re not swamped with client work, but you want to work on mixes and hone your skills (and build up a nice portfolio of finished mixes to share with potential clients)? 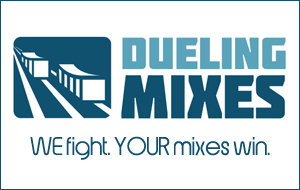 Then you need to jump on the ol’ Dueling Mixes bandwagon. You could mix this month’s song over the Thanksgiving holiday. And you could practice treating the song as if it was your very own. It’s more work, but the results are pretty amazing.